Once the finish has been transferred to a StopLossBag® it is easy to dispense, a lot or a little, into a cottage cheese container or other similar wide-mouthed container for applying the varnish. After pouring out what you need simply squeeze any bubble out of the bag before tightening the cap. Filling the bag can be done by using the StopLossBag® Collapsible Funnel which fits over an opened quart or liter can and the spout of a StopLossBag. It can be cleaned without solvents. Non-Glossy Finishes should be well stirred to insure the matting agents are in suspension before transferring to a StopLossBag®. After the transfer it will be easy to see through the clear bag wall the settled agents at the bottom of the bag. Putting them back into suspension is done by rotating and inverting the bag several times. It will be easy to see when it is ready to use. Use the white information block on the front of the bag to record the finish youre putting into each StopLossBag®. A Magic Marker type of pen works well, and it wipes away easily with alcohol. 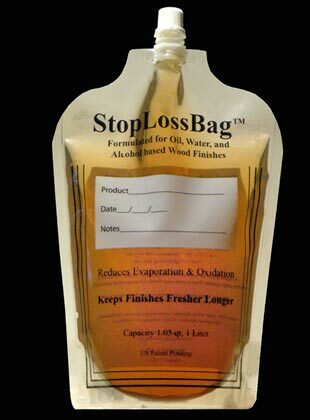 We wish you well on your woodworking projects and hope that you find StopLossBags® to be a positive addition to your woodworking by saving you money, giving your better and more consistent results, and reducing waste.